Daily Illuminator: What Does "Allocated" Mean For The Munchkin Collectible Card Game? February 18, 2018: What Does "Allocated" Mean For The Munchkin Collectible Card Game? It's official - the Munchkin Collectible Card Game has started shipping to distributors! Now that all of the orders are in, we're officially allocating the first wave of starters and boosters. (The entire second wave, expected next month, is already spoken for, as well.) We were hoping to avoid allocations at launch, but our hopes have been smashed on the rocks of reality, and we're left scrambling to get more starters and boosters as quickly as possible. So, what does "allocated" actually mean? Great question! Simply put: when the pre-orders for a new release exceed the press run, we have to decide how to best fill the orders with the games we have. Some distributors, especially those who ordered late, won't get the full number they requested. That's what "allocation" is. It might seem great to sell out the whole print run, and it's a good problem to have, but we never like telling our faithful distributors . . . or the retailers underneath them . . . that they can't have everything they want. Steve Jackson Games sells the majority of our games to distributors, who sell them to hobby-game specialty stores and mass-market retailers. We sell a small number of games direct to players through our online store, Warehouse 23, and an even smaller number direct to hobby retailers. For that reason, we have starters and boosters destined for our Austin warehouse. That's one pool of games that, despite allocations, is still available to purchase (although you may want to preorder from Warehouse 23 if you want to be sure to get games in the first wave). Our distributors (listed here) took roughly 95% of the first printing of the Munchkin Collectible Card Game . . . but that doesn't mean it's out of stock. Distributors use a combination of retailer preorders and their own judgment to determine order quantities for games, so we're certain that some of our larger distributors have games in stock and ready to ship to retailers. 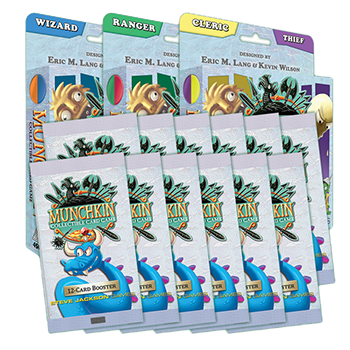 Even though we had to allocate the supply, that doesn't mean that retailers cannot order the Munchkin Collectible Card Game from their favorite distributor. In turn, retailers can order either from our distributors or direct from Warehouse 23. They place their orders based on demand from local players (use this form to preorder the game from your local retailer) and their own sales experience and expectations. Stores planning to run events probably ordered more boosters than stores that don't have room for in-store events, so even though our primary warehouse is out of stock on the game, there's a good chance you can find the Munchkin Collectible Card Game at your friendly local game store. So: On February 21, the official release date for the new Munchkin Collectible Card Game, your local store should have no problem offering both starters and boosters for sale. We won't know for a few weeks just how the allocations will affect sales of the game in stores. We anticipate that there will be enough copies so that all of you who have been anxiously awaiting the chance to play this new game will get to buy a starter and go head-to-head with a friend. The best way to guarantee that you get your hands on the new game, though, is to print this form and take it to your favorite local game store so that they can contact their distributor today and reserve your order. Thank you, everyone, for your interest in the new game. It is your excitement and preorders that have led to these unfortunate allocations, and we hope that you'll be out there in your local stores on February 21 to be one of the first to buy the game and show your friends just how great you are at bluffing and destroying them in this new Munchkin experience.